You should absolutely and without a doubt never – and I mean never – stay inside your car during a flash flood. You may think you’d be able to drive it out of whatever situation you may find yourself in but that’s simply not the case when thousands of gallons of water are rushing around it, at best you’d only lose your vehicle to the water damage but at least you’d have your life. 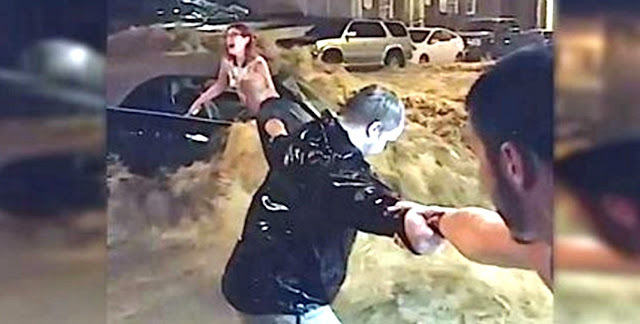 Out in Ellicot City in Maryland, there’s a woman who now owes her life to a couple random passerby’s who noticed she’d not only stayed in her car when things got wet, she was then trapped inside of it! One of those men is David Dempster, and with a little help they managed to safely extract the woman from the rushing flood waters without any further harm coming to any of them. You should absolutely and without a doubt never – and I mean never – stay inside your car during a flash flood. You may think you’d be able to drive it out of whatever situation you may find yourself in but that’s simply not the case when thousands of gallons of water are rushing around it, at best you’d only lose your vehicle to the water damage but at least you’d have your life. Out in Ellicot City in Maryland, there’s a woman who now owes her life to a couple random passerby’s who noticed she’d not only stayed in her car when things got wet, she was then trapped inside of it! One of those men is David Dempster, and with a little help they managed to safely extract the woman from the rushing flood waters without any further harm coming to any of them. If you do ever find yourself driving when a flash flood pops out of nowhere you should always remember that money and possessions aren’t worth the risk to your life, and get out of there! The safest bet you have at that point is to find a location where the waters can’t reach you so you can take shelter until the floods pass, something I’m positive that a woman will remember for the rest of her life.